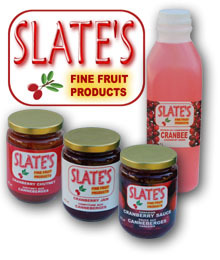 In 2008, after receiving countless requests for products made with our delicious cranberries, we introduced the Slate's brand. We took a considerable amount of time to carefully blend selected spices and natural sweeteners to develop our own very unique flavours - still tart, as cranberries should be, but not bitter. And of course, being the cranberry producer, we can start with the freshest berries. The honey and maple syrup we use bring out the truly wonderful taste of our berries. The flavour is not covered up by the huge amounts of refined sugar that you'll find in other products. We've had many inquiries from people who must watch their sugar intake, so in 2009, we developed a jam and a sauce made with artificial sweeteners. PREMIUM PRODUCTS AT REASONABLE PRICES! CRANBERRY JAM - like no other spread - everyone who tries it wants more! CRANBERRY SAUCE - too delicious to save for special occasions! CRANBEE Cranberry Drink - is a great thirst quencher and very popular. It retains the original and natural vitamine C of cranberries - unlike many beverages that provide synthetic vitamine C with ascorbic acid, which is used as an antioxidant, or preservative, in food products.